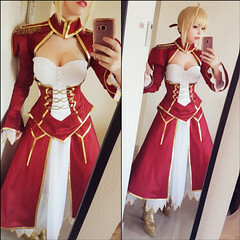 I am a big FATE fan since I started cosplay and Nero was one of the characters I always wanted to do when she got released. I was never brave enough to cosplay her when I was younger, but now I could finally finish this costume :D.
It looks not that difficult, but the see-through skirt and the very open back part of her corsage were difficult for me to make. I chose a darker shade of red than she usually wears, simply because I liked it more. I saw the darker red version on an artwork and took that as a reference. As fabrics I used silk, leather and petticoat tull. The sword is made from wood and foam. 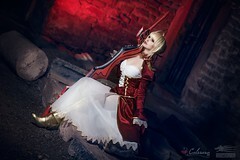 Everything on the costume is selfmade. The emboridery was made in cooperation with Naraku Brock and her embroidery machine (great thing! still took over 30h to embroider the tips of skirt and sleeves). I made the boots twice. My first boots were made from foam, but sadly they broke (because I was so stupid to take the wrong foam). I switched to leather and foam for my second version (which I am happy with). 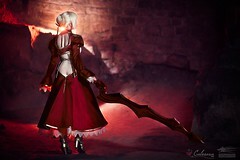 The sword is 1,80m long and it was my first prop made from foam. It was really challenging, but I am happy with the result. So I ended up taking way more time than I calculated to make this costume, but I am happy with the result and also with the great photos of Snowgrimm :).